Chief Justice John Roberts administering the presidential oath of office to Donald Trump on January 20, 2017. This clause is one of two oath or affirmation clauses, but it alone actually specifies the words that must be spoken. The other, Article VI, Clause 3, simply requires the persons specified therein to "be bound by oath or affirmation, to support this Constitution." The presidential oath, on the other hand, requires much more than this general oath of allegiance and fidelity. This clause enjoins the new president to swear or affirm that he "will to the best of his ability, preserve, protect and defend the Constitution of the United States." 4 "So help me God"
Franklin D. Roosevelt being administered the oath of office by Chief Justice Charles Evans Hughes on March 4, 1933, the first of Roosevelt's four presidential inaugurations. While the Constitution does not mandate that anyone in particular should administer the presidential oath of office, it is typically administered by the Chief Justice. There have been several exceptions, however. George Washington was sworn into office during his first inauguration, on April 30, 1789, by Chancellor of New York Robert Livingston. William Cranch, chief judge of the U.S. Circuit Court, administered the oath to Millard Fillmore on July 10, 1850, when he became president after the death of Zachary Taylor. Upon being informed of Warren Harding's death, while visiting his family home in Plymouth Notch, Vermont, Calvin Coolidge was sworn in as president by his father, John Calvin Coolidge Sr., a notary public. Federal Judge Sarah T. Hughes administered the oath of office to Lyndon B. Johnson aboard Air Force One after John F. Kennedy's assassination on November 22, 1963; the only time a woman has administered the oath of office. Overall, the presidential oath has been administered by 15 Chief Justices (one of whom—William Howard Taft—was also a former president), one Associate Justice, four federal judges, two New York state judges, and one notary public. The Constitutional language gives the option to "affirm" instead of "swear". While the reasons for this are not documented, it may relate to certain Christians, including Quakers, who apply this scripture literally: "But above all things, my brethren, swear not, neither by heaven, neither by the earth, neither by any other oath: but let your yea be yea; and your nay, nay; lest ye fall into condemnation" (James 5:12, KJV). Franklin Pierce was the only president known to use the word "affirm" rather than "swear." Herbert Hoover is often listed to have used "affirm" as well, owing to his being a Quaker, but a newsreel taken of the ceremony indicates that the words used were "solemnly swear." Richard Nixon, who was also a Quaker, also swore, rather than affirmed. There have been two forms of administering, and taking, the oath of office. Under the first form, now in disuse, the administrator articulated the constitutional oath in the form of a question, and modifying the wording from the first to the second person, as in, "Do you, George Washington, solemnly swear ..." and then requested an affirmation. At that point a response of "I do" or "I swear" completed the oath. It is believed that this was the common procedure at least until the early 20th century. In 1881, the New York Times article covering the swearing in of Chester A. Arthur, reported that he responded to the question of accepting the oath with the words, "I will, so help me God." In 1929, Time magazine reported that the Chief Justice began the oath uttering, "You, Herbert Hoover, do you solemnly swear ...", Hoover replied with a simple "I do". Under the second, and current form, the administrator articulates the oath in the affirmative, and in the first person, so that the president takes the oath by repeating it verbatim. Franklin Roosevelt, in 1933, stood silent as Chief Justice Charles Evans Hughes recited the entire oath, then repeated that oath from beginning to end himself. By the time of Harry Truman's inauguration in 1949, the practice was for the Chief Justice to utter the oath in phrases, with the president-elect repeating those phrases, until the oath was completed. By convention, incoming presidents raise their right hand and place the left on a Bible or other book while taking the oath of office. In 1789, George Washington took the oath of office with an altar Bible borrowed from the St. John's Lodge No. 1, Ancient York Masons lodge in New York, and he kissed the Bible afterward. Subsequent presidents up to and including Harry Truman, followed suit. Dwight Eisenhower broke that tradition in 1953 when he said a prayer instead of kissing the Bible. Theodore Roosevelt did not use a Bible when taking the oath in 1901. Both John Quincy Adams and Franklin Pierce swore on a book of law, with the intention that they were swearing on the constitution. Lyndon B. Johnson was sworn in on a Roman Catholic missal on Air Force One. Harry Truman, Dwight Eisenhower, Richard Nixon, George H. W. Bush, Barack Obama and Donald Trump each swore the oath on two Bibles. George H. W. Bush being administered the oath of office by Chief Justice William Rehnquist on January 20, 1989. It is uncertain how many presidents used a Bible or added the words "So help me God" at the end of the oath, or in their acceptance of the oath, as neither is required by law; unlike many other federal oaths which do include the phrase "So help me God." There is currently debate as to whether or not George Washington, the first president, added the phrase to his acceptance of the oath. No contemporary sources mention Washington as adding a religious codicil to his acceptance. The historical debate over who first used "So help me God" is marred by ignoring the two forms of giving the oath. The first, now in disuse, is when the administrator articulates the constitutional oath in the form of a question, as in, "Do you George Washington solemnly swear ...", requesting an affirmation. At that point a response of "I do" or "I swear" completes the oath. Without verbatim transcripts, the scant existing evidence shows this was the common procedure at least until the early 20th century. In 1865 the Sacramento Daily Union covered the second inauguration of Abraham Lincoln. Lincoln finished his oath with "So help me God", and he kissed the Bible. However, the Daily Union's account seems embellished in a number of ways, and other newspaper accounts, published closer in time to the ceremony, do not mention Lincoln's uttering the phrase. In 1881, the New York Times article covering the swearing in of Chester A. Arthur reported that he responded to the question of accepting the oath with the words, "I will, so help me God". In 1929, Time magazine reported that the Chief Justice began the oath uttering, "You, Herbert Hoover, do you solemnly swear ..." Hoover replied with a simple "I do". A Federal lawsuit filed in the District of Columbia by Michael Newdow on December 30, 2008, contended the second, current form of administration, where both the chief justice and the president articulate the oath, appending "So help me God", to be a breach of the Constitutional instructions. The suit distinguishes between the words spoken by the administrator, which must conform to the exact 35 words of the Constitution, and the president, who has a right to add a personal prayer, such as "So help me God". Chief Justice Roberts' reply was that his "prompting" for these four extra-constitutional words were to be recited "after" the oath of office, and not as a part of the oath as claimed in the suit. After rendering the oath to President Barack Obama, Roberts prompted with a question "So help you God? ", to which the president responded, "So help me God." The First Congress explicitly prescribed the phrase "So help me God" in oaths under the Judiciary Act of 1789 for all U.S. judges and officers other than the president. It was prescribed even earlier under the various first state constitutions as well as by the Second Continental Congress in 1776. Although the phrase is mandatory in these oaths, the said Act also allows for the option that the phrase be omitted by the officer, in which case it would be called an affirmation instead of an oath: "Which words, so help me God, shall be omitted in all cases where an affirmation is admitted instead of an oath." In contrast, the oath of the president is the only oath specified in the Constitution. It does not include the closing phrase "So help me God", and it also allows for the optional form of an affirmation which is not considered an oath. In practice, however, most presidents, at least during the last century, have opted to take the oath (rather than an affirmation), to use a Bible to do so, and also to close the oath with the customary phrase. The earliest known source indicating Washington added "So help me God" to his acceptance, not to the oath, is attributed to Washington Irving, aged six at the time of the inauguration, and first appears 65 years after the event. The only contemporary account that repeats the oath in full, a report from the French consul, Comte de Moustier, states only the constitutional oath, without reference to Washington's adding "So help me God" to his acceptance. Evidence is lacking to support the claim that presidents between Washington and Abraham Lincoln used the phrase "So help me God". A contemporaneous newspaper account of Lincoln's 1865 inauguration states that Lincoln appended the phrase "So help me God" to the oath. This newspaper report is followed by another account, provided later in the same year after Lincoln's death (April 15, 1865), that Lincoln said "So help me God" during his oath. The evidence pertaining to the 1865 inauguration is much stronger than that pertaining to Lincoln's 1861 use of the phrase. Several sources claim that Lincoln said "So help me God" at his 1861 inauguration, yet these sources were not contemporaneous to the event. During the speech, Lincoln stated that his oath was "registered in Heaven", something some have taken as indicating he likely uttered the phrase "So help me God." Conversely, there was a claim made by A. M. Milligan (a Presbyterian minister who advocated for an official Christian U.S. government) that letters were sent to Abraham Lincoln asking him to swear to God during his inaugurations, and Lincoln allegedly wrote back saying that God's name was not in the Constitution, and he could not depart from the letter of that instrument. All federal judges and executive officers were required as early as 1789 by statute to include the phrase unless they affirmed, in which case the phrase must be omitted. Given that nearly every president-elect since President Franklin D. Roosevelt has recited the codicil, it is likely that the majority of presidents-elect have uttered the phrase (as well as some vice presidents, while taking their oaths). However, as President Theodore Roosevelt chose to conclude his oath with the phrase "And thus I swear", it seems that this current of tradition was not overwhelmingly strong even as recently as the turn of the twentieth century. Barack Obama being administered the oath of office by Chief Justice John Roberts for the second time, on January 21, 2009. In 1909, when President William Howard Taft was sworn in, Chief Justice Melville Fuller misquoted the oath, but the error was not publicized at the time. The mistake was similar to the one Taft himself would make twenty years later when swearing in President Hoover. Recalling the incident, Taft wrote, "When I was sworn in as president by Chief Justice Fuller, he made a similar slip," and added, "but in those days when there was no radio, it was observed only in the Senate chamber where I took the oath." In 1929, Taft, later the Chief Justice, garbled the oath when he swore in President Herbert Hoover using the words "preserve, maintain, and defend the Constitution", instead of "preserve, protect, and defend". The error was picked up by schoolgirl Helen Terwilliger on the radio. Taft eventually acknowledged his error, but did not think it was important, and Hoover did not retake the oath. In Taft's view, his departure from the text did not invalidate the oath. In 1945, President Harry S. Truman's bare initial caused an unusual slip when he first became president and took the oath. At a meeting in the Cabinet Room, Chief Justice Harlan Stone, apparently mistaken about the meaning of Truman's middle initial (which is not an abbreviation but rather the whole middle name in itself), began reading the oath by saying "I, Harry Shipp Truman ...", Truman responded: "I, Harry S Truman, ..."
In both his 1953 and 1957 inaugurations, Dwight D. Eisenhower read the line "the office of President of the United States" as "the office of the President of the United States," even as Chief Justices Fred Vinson (in 1953) and Earl Warren (in 1957) said the line correctly. In 1965, Chief Justice Earl Warren prompted Lyndon Johnson to say, "the Office of the Presidency of the United States". In 1973, President Richard Nixon added the word "and" between "preserve" and "protect", resulting in "preserve and protect, and defend the Constitution of the United States." Nixon had recited the line correctly during his first inauguration. In 2009, Chief Justice John G. Roberts, while administering the oath to Barack Obama, incorrectly recited part of the oath. Roberts prompted, "That I will execute the Office of President to the United States faithfully." Obama stopped at "execute," and waited for Roberts to correct himself. Roberts, after a false start, then followed Obama's "execute" with "faithfully", which results in "execute faithfully," which is also incorrect. Obama then repeated Roberts' initial, incorrect prompt, with the word "faithfully" after "United States." The oath was re-administered the next day by Roberts at the White House. Since the office of President of the United States came into existence in 1789 there have been 58 public swearing-in ceremonies to mark the commencement of a new four-year presidential term, plus an additional nine marking the start of a partial presidential term following the intra-term death or resignation of an incumbent president. With the 2017 inauguration of Donald Trump, the presidential oath has been taken 75 different times by 44 persons. This numerical discrepancy results chiefly from two factors: a president must take the oath at the beginning of each term of office, and, because Inauguration Day has sometimes fallen on a Sunday, five presidents have taken the oath privately before the public inauguration ceremony. In addition, three have repeated the oath as a precaution against potential later constitutional challenges. Washington, D.C. Adolph A. Hoehling, Jr.
^ Inaugurations sort alphabetically by president's last name. ^ a b c d e Term began Sunday, March 4. ^ Term began when President Harrison died on April 4. ^ Term began when President Taylor died on July 9. ^ a b Term began when President Garfield died on September 19. ^ a b Term began when President Harding died on August 2. ^ a b c Term began Sunday, January 20. ^ Oath repeated after "mishap" at the public ceremony. Map showing locations where the oath of office was first taken, marked with a green 'O' (or a green dot for scheduled occurrences). Locations where presidencies ended unexpectedly are marked with a red 'X' (a red dot denoted scheduled transitions). The nine sets of names shown in black denote the location where presidencies have ended intra-term due to the incumbent's death (four presidents have died of natural causes and four were assassinated—names underlined in grey) or resignation (one, noted by a superscript 'R'). The inset at the bottom of the map is Oath or Affirmation Clause (Article II, Section One, Clause 8) of the U.S. Constitution. ^ Kesavan, Vasan. "Essays on Article II: Oath of Office". The Heritage Foundation. Retrieved July 20, 2016. ^ "The Constitution of the United States of America: Analysis and Interpretation, Centennial Edition, Interim Edition: Analysis of Cases Decided by the Supreme Court of the United States to June 26, 2013" (PDF). Washington, DC: U.S. Government Printing Office. 2013. p. 13. ^ "Presidential Election of 1789". George Washington's Mount Vernon. Mount Vernon Ladies' Association. Retrieved October 21, 2015. ^ "George Washington's Inaugural Address". The National Archives. Retrieved October 4, 2015. ^ "President Millard Fillmore, 1850". Joint Congressional Committee on Inaugural Ceremonies. Retrieved 2009-01-23. ^ Glenn D. Kittler, Hail to the Chief! : The Inauguration Days of our Presidents, 1965, page 167. ^ Porter H. Dale, "The Calvin Coolidge Inauguration Revisited: An Eyewitness Account by Congressman Porter H. Dale", Vermont History, 1994, Volume 62, pp. 214–222. ^ "Oath Of Office: To Swear Or To Affirm". NPR.org. January 18, 2009. ^ Bendat, Jim (2012). Democracy's Big Day: The Inauguration of Our President, 1789-2013. iUniverse. pp. xi, 28, 36. ISBN 978-1-935278-47-4. ^ a b "The New Administration; President Arthur Formally Inaugurated" (PDF). The New York Times. September 23, 1881. ^ a b c d Time Magazine, Mar. 25, 1929]. Retrieved 2009-01-23. ^ Herbert Hoover Takes the Oath of Office. February 6, 2009 – via YouTube. ^ Franklin D. Roosevelt – Oath of office March 4th, 1933. June 19, 2007 – via YouTube. ^ Harry S. Truman – Oath of office January 20th, 1949. June 19, 2007 – via YouTube. ^ http://www.stjohns1.org/portal/gwib "St. John's Lodge No. 1, Ancient York Masons". ^ Joint Congressional Committee on Inauguration Ceremonies website: "Inauguration of President George Washington, 1789". Retrieved 2009-02-16. ^ McCullough, David (1992). Truman. New York: Simon and Schuster. pp. 347, 729. ISBN 0-671-86920-5. Harry Truman is a notable example, as he bent and kissed the Bible upon taking the oath for the first time, on April 12, 1945, as well as at his second inauguration. ^ "Inaugural fun facts". Toledo, OH: WTOL.com. Retrieved 2010-08-07. ^ Wallner (2004), pp. 249–255. ^ Kennon, Donald (2005). "Presidential Inaugurations Past and Present". Retrieved 2006-12-06. ^ Glass, Andrew J. (February 26, 1967). "Catholic Church Missal, Not Bible, Used by Johnson for Oath at Dallas" (PDF). The Washington Post. Retrieved June 15, 2014. ^ "United States Code: Title 28,453. Oaths of justices and judges | LII / Legal Information Institute". Law.cornell.edu. 2010-01-21. Retrieved 2010-08-07. ^ Peter R. Henriques, "'So Help Me God': A George Washington Myth that Should Be Discarded". History Bytes News Network (January 12, 2009). ^ a b "Letters from Washington: Inauguration Day". Sacramento Daily Union. April 10, 1865. p. 8. Retrieved December 18, 2018 – via California Digital Newspaper Collection. ^ "Case 1:08-cv-02248-RBW Document 1" (PDF). www.restorethepledge.com. 2008-12-30. p. 25. Retrieved 2009-02-04. ^ "Case 1:08-cv-02248-RBW Document 13-9" (PDF). www.restorethepledge.com. 2009-01-08. p. 25. Retrieved 2009-02-04. Before the commencement of this lawsuit, the Chief Justice instructed me to ascertain from President-elect Obama's representatives the president-elect's wishes concerning the administration of the oath of office at the inauguration—including his wishes concerning the inclusion of the phrase 'So help me God' after the conclusion of the constitutional oath. ^ "Georgia Constitution of 1777". GeorgiaInfo. University of Georgia Libraries. Archived from the original on 2012-11-14. Retrieved 2012-11-28. ^ "Intelligence in the War of Independence". Central Intelligence Agency. Archived from the original on December 10, 2008. Retrieved December 26, 2008. ^ "Oaths of Enlistment and Oaths of Office". U.S. Army Center of Military History. Retrieved 31 March 2018. ^ Judiciary Act of 1789, Sec. 7. Retrieved 2009-01-24. ^ Griswold, Rufus W. (1855) . The Republican court, or, American society in the days of Washington. New York: D. Appleton and Company. pp. 141–142. ^ Documentary History of the First Federal Congress, Vol. 15, pp. 404–405. ^ Benjamin Franklin Morris, ed. (1865). Memorial record of the nation's tribute to Abraham Lincoln. W. H. & O. H. Morrison. Retrieved 2010-08-07. ^ Chittenden, Lucius Eugene (1904). Recollections of President Lincoln and his Administration. Harper & Brothers. Retrieved 2010-08-07. ^ Peter Selby (1900). Anecdotal Lincoln. Thompson & Thomas. Retrieved 2010-08-07. ^ "First Inaugural Address of Abraham Lincoln". The Avalon Project. Lillian Goldman Law Library, Yale University. ^ Foster, James Mitchell (1890). Reformation Principles Stated and Applied. Chicago and New York: F. H. Revell. pp. 234–235. ^ "A Century of Lawmaking for a New Nation: U.S. Congressional Documents and Debates, 1774–1875". ^ "Inauguration of the President: Facts & Firsts". U.S. Senate. Retrieved December 13, 2008. ^ Agence France-Presse (2009-01-21). "Chief justice leads Obama to stumble presidential oath". ABS-CBN News. Retrieved 2010-08-07. ^ "No Problems With Today's Oath at the Supreme Court – The BLT: The Blog of Legal Times". Legaltimes.typepad.com. 2009-01-21. Retrieved 2010-08-07. ^ "Lyndon B. Johnson Oath of Office, January 20, 1965". Retrieved 2009-02-01. ^ Williams, Pete (January 20, 2009). "About That Oath Flub". MSNBC. Archived from the original on January 21, 2009. Retrieved January 21, 2009. ^ "Obama retakes oath of office after Roberts' mistake". CNN. January 21, 2013. Retrieved January 21, 2009. ^ Obama is Sworn in for Second Time, BBC News. Retrieved January 22, 2009. 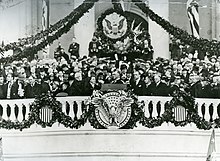 ^ "Inauguration at the U.S. Capitol". Architect of the Capitol. Retrieved January 22, 2017. ^ "Spiegel Grove: Rutherford B. Hayes Presidential Center". National Park Service, U.S. Department of the Interior. Retrieved February 5, 2017. ^ "Chester A. Arthur House". National Park Service, U.S. Department of the Interior. Retrieved February 5, 2017. ^ "Wilson to Take Oath Sunday: First Swearing Into Office on March 4 Will Be Repeated the Following Day". The New York Times. November 15, 1916. Retrieved February 5, 2017. ^ a b Arbelbide, C. L. (Winter 2000). "Abrupt Transition". Prologue. Vol. 32 no. 4. The National Archives. Retrieved February 5, 2017. ^ "Obama retakes oath of office after Roberts' mistake". CNN. January 21, 2009. Retrieved January 21, 2009. ^ "Obama to take private oath in brief family service". Wikimedia Commons has media related to Oath of office of the president of the United States. Forrest Church, Ph.D., "Did George Washington Say 'So Help Me God'?" This page was last edited on 13 April 2019, at 13:56 (UTC).